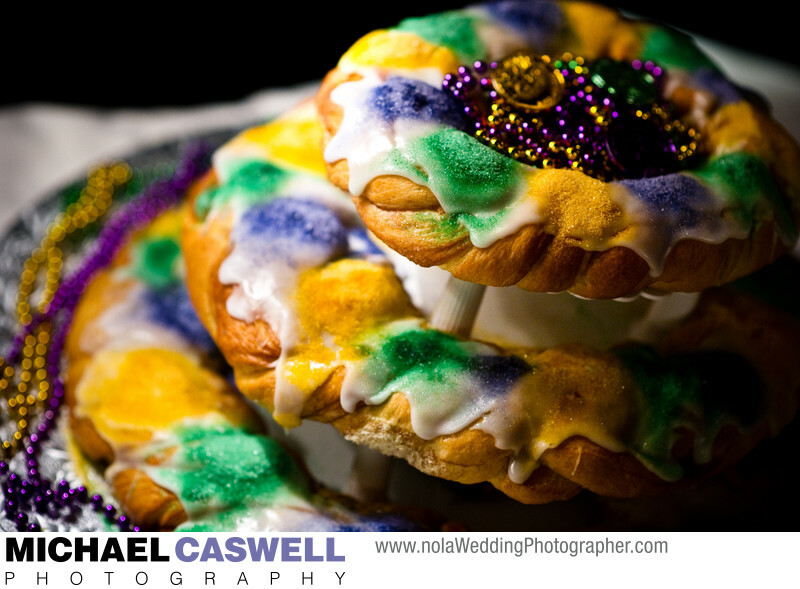 King cakes are an enormously popular Mardi Gras tradition in New Orleans, and every now and then one will turn up at a wedding. This will usually be in the form of the groom's cake, as was the case with this multi-tiered bakery creation at the Elms Mansion, though I've also had weddings with this kind of cake being the primary cake. While this particular wedding celebration occurred during carnival season (which runs roughly from early January through mid-February or early March) when king cakes are aplenty, you can still order them during other times of the year for delivery anywhere in the country from bakeries such as Haydel's or Randazzo's, and bakeries will almost always accommodate a request for a wedding king cake. Typically consisting of Danish dough, embedded with cinnamon and twisted into a braided round shape, these treats are traditionally topped with icing and colored sugar with traditional Mardi Gras colors of purple, green, and gold (symbolizing justice, faith, and power), though in some cases a simple non-colored white icing will be used. In any case, a king cake makes for a delicious taste of New Orleans that your guests, especially those from out of town, will surely love!